This 15 piece assortment includes our most popular selection of creams, nuts and chews in milk and dark chocolate. 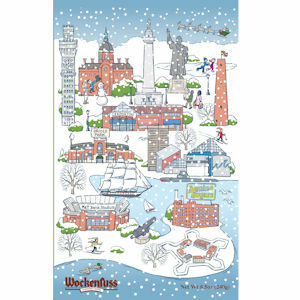 The gift box features our favorite Baltimore landmarks: Johns Hopkins Hospital, Bromo Seltzer Tower, Washington Monument, Martin Luther, Lexington Market, Shot Tower, Oriole Park at Camden Yards, Baltimore Aquarium, Inner Harbor, M & T Bank Stadium, Federal Hill, Domino Sugar and Fort McHenry. The box measures 6″ x 9.75″. Sugar, Whole & Non-Fat Milk, Cocoa Butter, Corn Syrup, Chocolate Liquor processed with alkali, Invert Sugar Syrup, Fondant Sugar, Coconut, Cashews, Pecans, Peanuts, Butter, Molasses, Orange Pulp, Applesauce, Palm Kernel Oil, Salt, Dry Egg White, Cocoa, Soy Lecithin (an emulsifier), Canola Oil, Water, Vanillin (artificial Flavor), Glycerin, Invertase, Alcohol, Partially Defatted Peanut Flour, Non-Fat Dry Milk Solids, Peanut Oil, Locust Bean Gum, Xanthan Gum, Citric Acid, Propylene Glycol, High Fructose Corn Syrup, Dextrose, Bitter Almond Oil (Synthetic), Agar Agar, Pectin, Peppermint Oil, Natural & Artificial Flavors, Sodium Citrate, Confectioner's Glaze, Caramel Color, Sodium Carboxymethlycellulose, Dipotassium Phosphate, Carrageenan, Vitamin D3, Potassium Sorbate & Sodium Benzoate (preservative), Artificial Colors (FD&C Red 3 & 40, Yellow 5 & 6, Blue 1), Modified Food Starch, Sulphur Dioxide & Sodium Metabisulphite (preservatives) and Sodium Lauryl Sulfate (whipping aid). Contains Milk, Peanuts, Tree Nuts and Soy.